Welcome to part 2 of A Street Frames‘ custom frame creation process. 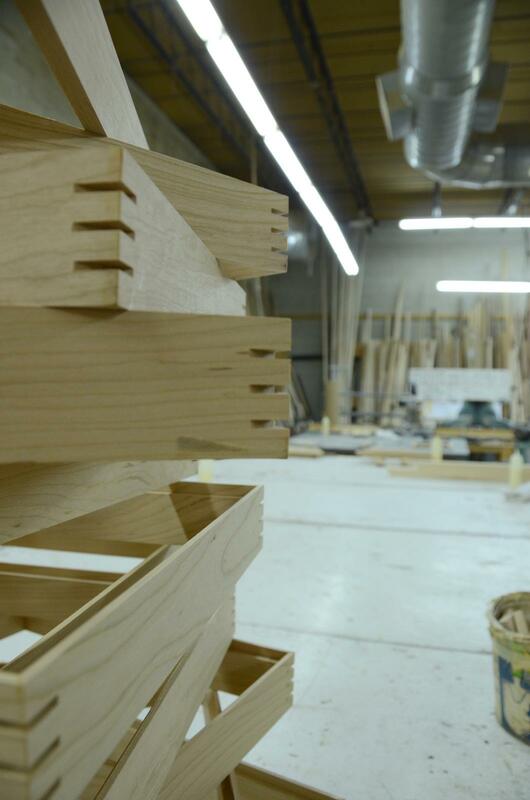 Last time we walked you through the milling stage, and now we’re on to joining and sanding. Hope you enjoy! After the milling is done the wood is wrapped up and placed in the proper bin for the cutter. 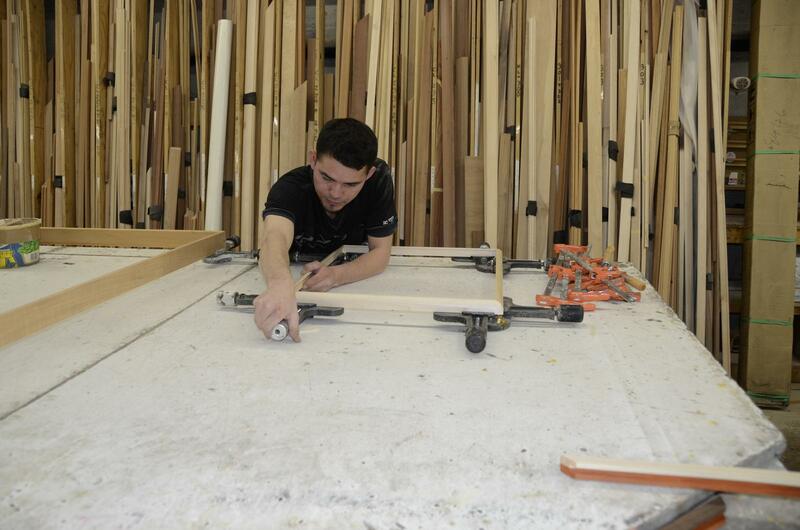 His job is to cut the frame to the proper size specified by the frame designer. He needs to identify the profile, the species of wood and the finish to choose the perfect lengths to cut from. He must be familiar with the properties of each type of wood and the different finishes to guide his selection. Certain finishes are more forgiving, and a few random imperfections may be fine where natural finishes and light stains are not forgiving. He also needs to understand wood and the particular characteristics of the different species. For example, maple wood often has dark spots from growth in the tree. If this was used for a light finish such as our Amber, it would come through glaringly and would not pass our standards. However, if the finish were a solid lacquer color, that would completely cover the maple wood and that imperfection would be acceptable as it does not affect the integrity of the frame. 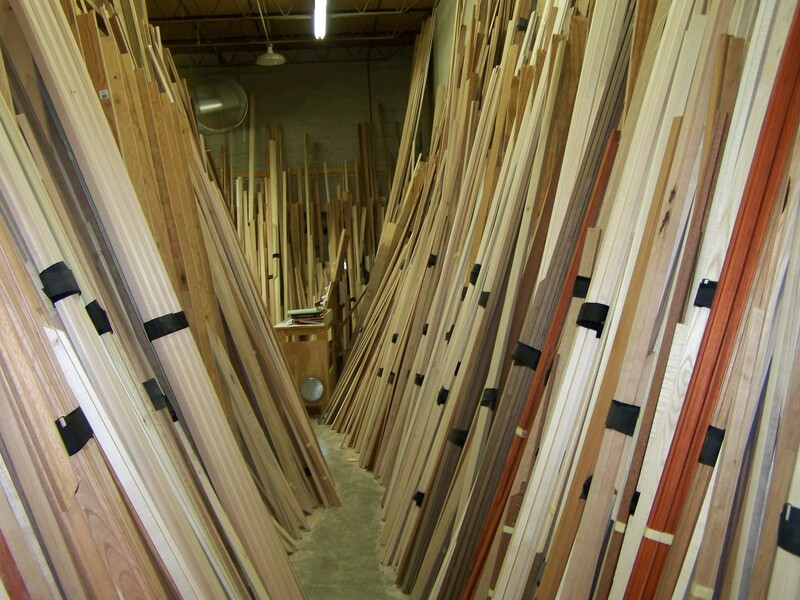 When choosing lengths for figured woods, such as tiger maple or bird’s eye maple, the cutter must be even more scrupulous. He needs to select stock which is consistent in color and figure while being mindful of how the individual legs of the frame match at the miters. We have to establish what is acceptable, when there are enough eyes in the bird’s eye and when there aren’t enough. Wood stock milled and ready for chopping. Every frame is one-of-a-kind and we have a very high standard, but sometimes people don’t understand the uniqueness of each length of wood. We often hear that they want their frame to match the sample they have exactly; when that customer is in California with a sample we made 3 years ago, it can be very tricky. When we make samples for our frame shop customers, I always stress not using stock with exceptionally high figure. Scott, who heads up our Empty Frame Division, gets to know our customers very well and usually knows when it may be best to send a call tag for their sample so we can match it as best as possible. After the frame is cut and labeled it goes to the joiner. His job is to select the best method of joining the frame. There are four methods that we use; splines, underpins, Hoffman keys, or biscuits, and sometimes a combination of methods. Each joining method works for different frame profiles and wood properties. 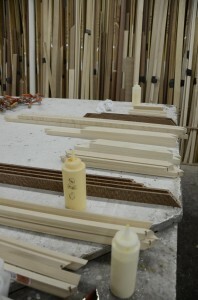 If the frame is tall and skinny, splines work best to increase the surface area for gluing. If it is a wide, flat frame, a biscuit may be the best option. Smaller frames would require the underpinning process or the Hoffman key, which looks like a dovetail joint. Gluing a frame together before splining. If we are splining or underpinning the frame, the first step is to glue the corners together. Once they’ve been set up, they are run through the router to create slots for the splines. 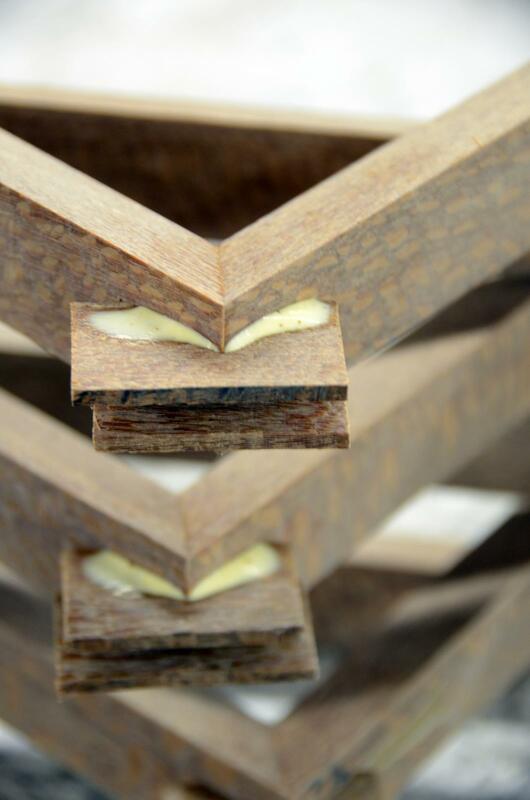 Then the same species of wood is cut into thin strips which fit perfectly into the routed slots. These are glued in for more surface area and a secure hold that is far superior to a couple of straight nails. Splines inserted and glued into the slots. Then the same species of wood is cut into thin strips which fit perfectly into the routed slots. These are glued in for more surface area and a secure hold that is far superior to a couple of straight nails. Glued frames after going through the router for splines. Underpinned frames are taken to the underpinner which shoots a specially shaped V nail into the bottom of the frame. For the Hoffman key and Biscuit method, the cutouts are done prior to joining the corners. The Hoffman key is similar to an underpinner but it is a small plastic piece instead of a metal nail, and it must have a cutout before joining. Biscuit joining is invisible in the final product. The cutout is inside the joint and creates more surface area to adhere to. A biscuit is inserted into the cutout and fits into both sides of the mitered corner. Glue is applied and the frame is pieced together and left to set up. Whichever method the joiner chooses, it takes time and consideration to ensure that the corners are strong and properly set up before sending it to the sanders. 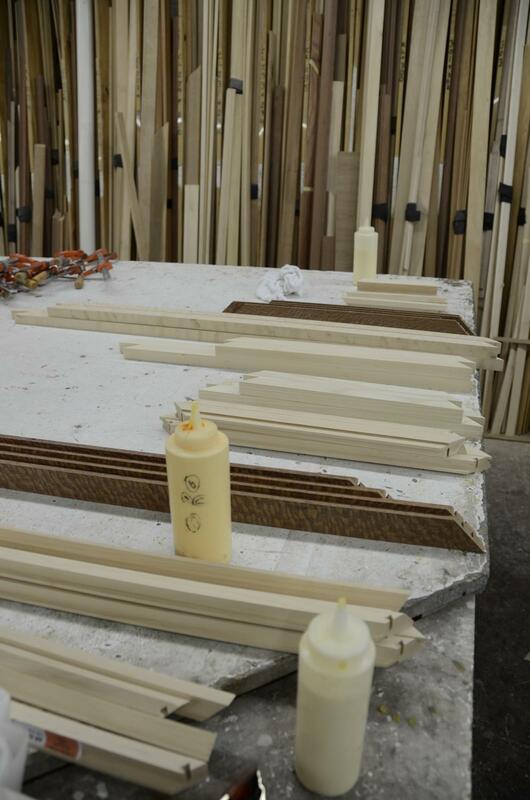 Sanding is a delicate and important step in creating a custom frame. This is where a frame can easily be destroyed. Over-sanding is the most common mistake a novice sander can make, and a clean line contemporary frame is often more difficult to sand than a molding with a more complicated profile. One slip off the edge of the face and the clean pristine line is gone. Like many things, it all begins at the foundation. If the milling is poor, the sanding is all the more difficult (and sometimes impossible!) 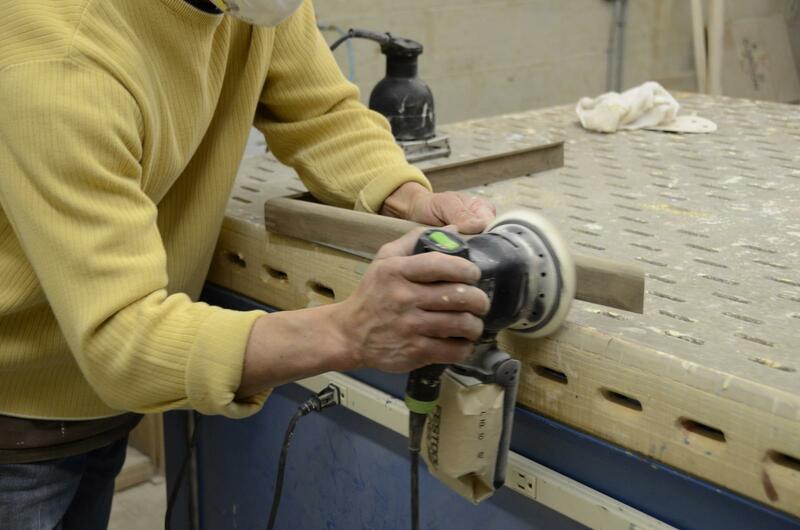 The more time the sanding machine is on the wood, the more likely it will result in a bad job. Sanding a sample with the sanding machine used for most frames. Sanders tend to want to push down on the machine. I keep telling them to let the machine do the work — your job is to guide it. After my little lesson, I’ll pass by the sanding room and see the muscles in their arms flexed — they’re back to their old habits and it’s time for a new lesson. Not only is this practice bad for the frame, it’s bad for the sander. I have each sander initial the inside of the frame so I know who the culprit is when a frame has been poorly sanded. This isn’t to chastise the man. It’s to teach him. It’s all about quality control. A poor sanding job will show through every finish, even an opaque lacquer. The sanders work on down-draft tables which remove most of the dust from the air. Now the frame is ready for the finishing room, the last step of the process. I honestly cannot say any one job is more difficult than the other, but if I had to pick one, it would be the finishing. We’ll cover that in Part III of Making Your Custom Frame.